Need inspiration for your home transformation project? Explore remodeling’s finest at the National Association of the Remodeling Industry (NARI) of Madison Remodeled Homes Tour. The Remodeled Homes Tour invites visitors to experience firsthand the finest craftsmanship and most innovative ideas in home remodeling. Attendees will have the opportunity to tour recently completed projects located in Madison and its surrounding areas. During this event, you will have a chance to tour whole house transformations, additions, kitchens, bathrooms, and more! Come gather inspiration, see what’s trending, and have the chance to get expert advice from NARI remodeling professionals. See Vive’s subtly sophisticated Middleton basement transformation on this year’s tour! 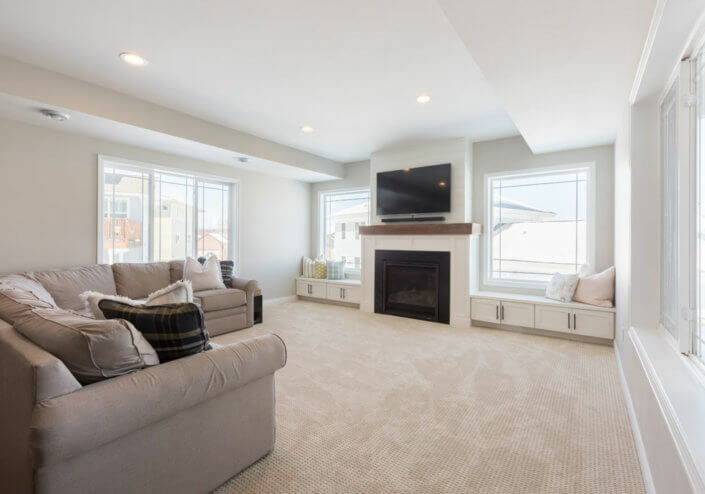 This Middleton, Wisconsin, basement finish created a subtly sophisticated space that is perfect for a family to entertain adults and children. 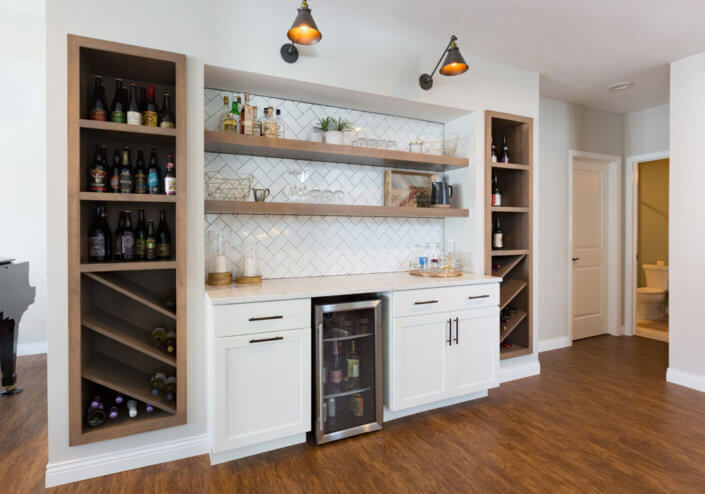 The floorplan was maximized to include a combination playroom and piano room area, bathroom, dry bar, guest bedroom, family room, and a mudroom-like space dedicated to homebrewing! Vive Homes Transformations designed the basement floorplan to work hard for a growing family that needed more functional space. The feature pieces of the basement finish are the rustic modern dry bar and fireplace, and white trim throughout brings a crisp, clean look. The dry bar has a herringbone white subway tile backsplash, quartz countertops, maple white icing cabinet finish and goose neck wall sconces. Its floating shelves and built-ins are stained with a popular, custom selection: a natural wood tone with a slight gray undertone. The family room fireplace has a timber mantle, with a surround detailed to match the door style of the window benches, which provide excellent storage. The layout accommodates a beloved piano that was hard for the homeowners to find room for on the first floor. 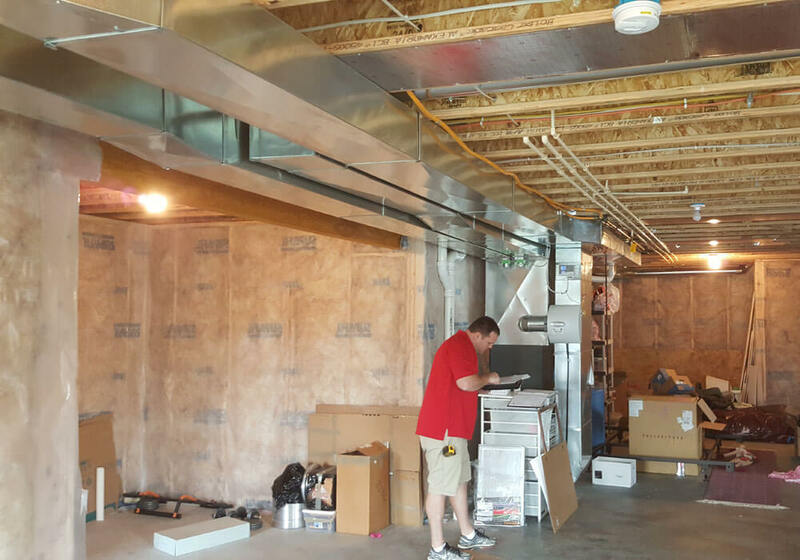 A separate room was designed specifically for the client to brew his own beer. The space has LVT flooring for easy clean-up, plenty of counter workspace and a sink for brewing. Bathroom cabinetry has a cappuccino finish, offset nicely by cultured marble counters. Also tied into the floorplan is a walkout for backyard access. The Vive Home Transformations design team took great care to blend the basement finish with the first floor, which was completed by another contractor. 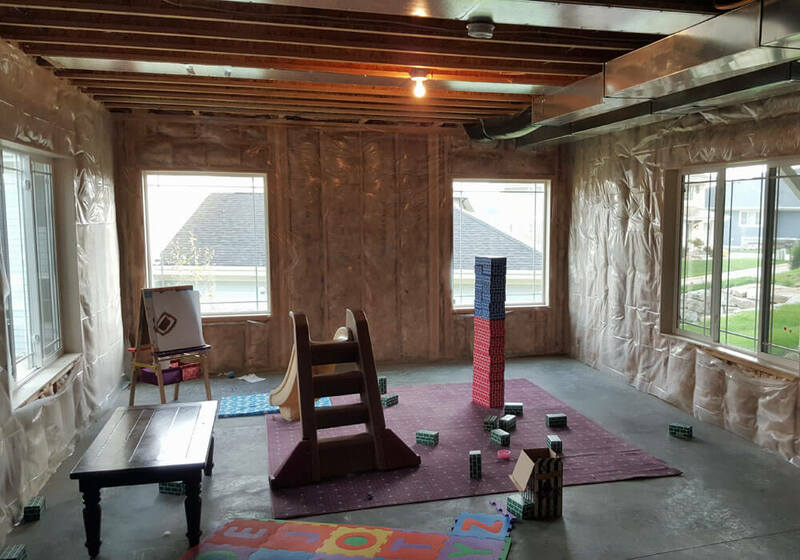 This can help with resale and remodeling ROI in the future, though the finished basement fits the homeowners current lifestyle so well, long-term ownership is likely! Admission: $10 per family (one ticket will allow entry for a family into all tour sites). Tickets for the tour may be purchased at any of the tour site locations the day of the event. Admission includes a tour guidebook with pictures, highlights and directions to each home, and a NARI home remodeling directory. If you are interested in remodeling your home, we would love to have you visit our tour site! Please complete the form below to request complimentary tickets. Tickets will be mailed to the address entered below.